The police in Copenhagen are going after those rogues of the urban landscape - the bicycle users - this week. It's generally slim pickings for them. The 99% usually cycle without committing any major terrorist actions - and have done for 125 years. The police are arch-conservative and continue to insist that societal decay is imminent. 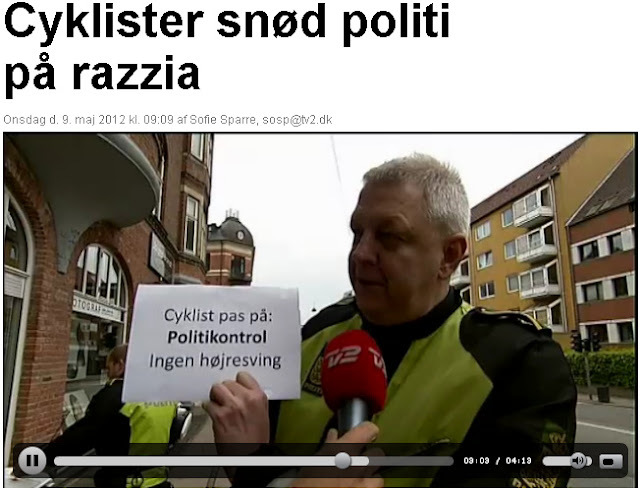 In the course of an average week with these bike raids - cykelrazzia in Danish - they'll ticket about 700-1200 people. Out of a few hundred thousand daily bicycle users. Brilliant use of resources. The man in the photo, above, is Mogens Knudsen, Superintendent in Copenhagen Police Traffic Unit. It's his personal crusade to clamp down on cyclists and all talk of traffic calming, lower speed limits and other modern urban devices is swept aside by Mogens. If there is one law enforcement officer in Copenhagen who is desperately holding back the hands on the clock of progress, you're looking at him. As my colleague Lars Barfred put it, "For Knudsen, 30 km/h zones are like legalising heroin." I debated with Knudsen a couple of years ago at the National Cycle Conference, which you can read about in this article. Little has changed. If you're wondering what the photo is up top, it's a fine example of a bit of cyclist activism. The police were hiding around a corner, stopping cyclists who rolled casually around the corner despite the red light. There was a long period where nothing happened. Then they looked around the corner and found this sign hanging next to the cycle track. It says, "Watch out cyclists. Police Checkpoint. No right turn..."
Bicycle users warning each other. To his credit, Knudsen took it casually. "It's fair enough. We're hiding around the corner and they are helping each other. It's large-heartedness." Yes it is. What it also is, is a good sign. It's a sign that the bicycle users in Copenhagen are thinking differently. They are reacting to the rising car-centricism, not only from the police. Activism is a rare thing in Copenhagen, but it remains a necessity and I welcome every bit of it. Citizens reacting to 75 years of failed traffic engineering that continues to place the car on a pedestal. Even in Copenhagen. We've been doing a bit of activism as well. Running a twitter account and Facebook group where bicycle users can warn each other. It's good fun. And if you're a student you can get a 50% discount on any fine you get. Here's our article about the last police raid on cyclists and how the City of Copenhagen has been handed a map over locations where infrastructure and desire lines for cyclists can be improved. No News is Big News.